Erve The Klaas House is a characteristic mansion decorated in the English style. 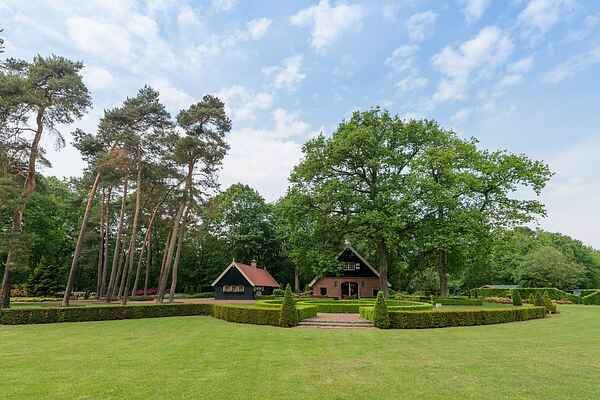 In the middle of the old estate 'Het Hulsbeek' in Oldenzaal you will find this oasis of peace. When you drive up the driveway, you'll pause when you first see the 10.000m2 garden with box hedges, trees and the spacious terrace. The English interior and the gas fire create a romantic atmosphere. You have a beautiful view of the garden from the dining room. The bedrooms all have an en suite bathroom with shower and/or bath. The outbuilding has a covered terrace with fireplace and patio heaters, so you can relax outside until the wee hours. The mansion is comfortable and furnished with care. You will experience nature and tranquility in and around the house. The mansion is on a former estate that was converted into a beautiful nature area in 1970. The wooded area is ideal for walks and bike rides. You will find recreational lakes where you can swim, sunbathe, fish and even surf. In the park you will find the largest outdoor skatepark in Europe, a jogging track, mountain bike route and a playground for children. If you want more challenge, you can consider ballooning, karting, quad biking, laser gaming and paintball. For relaxation, go to Saré Thermen & Beauty. Everything is within walking distance of the mansion. Ootmarsum and the cities of Oldenzaal, Hengelo and Enschede are worthwhile if you want to do something outside the recreation park. This holiday home in this special place offers opportunities for everyone. Have a relaxing time at Erve Het Klaashuis. The nicely decorated house is in the middle of a nature area. Walking, biking, swimming. All this is easy to undertake.